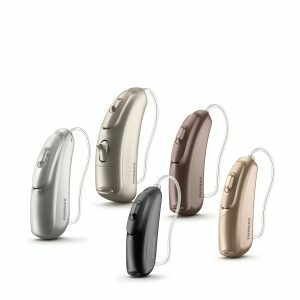 These are the latest offerings from Phonak, the Audeo Belong range. First impressions are they have added a few curves over the last Audeo Venture and now the push button is larger but the real game changer is the technology on board these hearing aids. The down side is that the rechargeable version is slightly larger in size than the normal battery version, but for some this may not be a problem. Understand more in noise 60% improvement in speech understanding by zooming in on a single voice in a noisy environment – versus without hearing aids. Better speech understanding 20% better speech understanding thanks to the automatic selection of the best setting for everyday listening situations. Hear quiet voices 10% improvement in soft speech understanding with our newest products. This all means that it is out performing the other hearing aids in these situations. But interestingly enough, Phonak have not introduced any direct connection function to mobile phones. Direct wireless connections between hearing aids and mobile phones seems to be a popular feature among the younger users, such hearing aids as Oticon Opn, Starkey Halo and ReSound Linx2 all have this feature which enables the hearing aid wearer to take phone calls through the hearing aid, use the phone as a remote and wireless microphone. Instead Phonak have stuck with the additional accessories such as the Compilot Air 2 to connect the mobile phone TV and anything bluetooth. Lets not forget that these hearing aids like the previous range are rated to a standard of IP68. This means they are dust proof and water proof down to 3 metres for 30 minutes. You will find that hearing aids companies always conduct trials of their new hearing aids before they are released onto the market. The above Phonak user trials some a very high level of satisfaction with the rechargeable battery version (B-R).